Eating olives while walking around downtown with him, but secretly spitting out the purple ones! 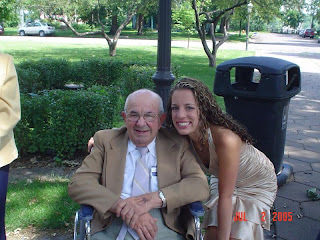 Later when he spent time in a nursing home I'd bring him olives when I visited, and shortly after he passed away I'd tear up at the olive bar in the grocery store (I still do some times). He loved chocolate and preferred it because "You can't see the dirt!" His room was always stocked with secret snacks: Pringles, Bugles, nuts, etc. Pap and my Dad (his son-in-law) both share a birthday, September 19, and also were forced to celebrate Father's Day together. Both holidays always involved seafood fests which stunk up the house and/or cabin! Eating calamari - another sharing experience, I'd eat the rings and he took care of the (yucky!) legs. There's a certain place in Pittsburgh that sold tripe (cow's stomach) and we'd always pick it up and he'd eat it in the car, gross! The smell would make me want to hang my head out the window like a dog! He always tried to get me to try some but I never did. He had a fig tree in his yard and I was always dying to get my hands on them as a kid. He'd tell me "they'll be ready when it's time to go back to school!" While he was in the hospital I was home from college for Christmas break. We tried to make sure someone was always there with him throughout the day, so one night I took over for Mom and was there with Pap for his dinner. I fed him his salad, coffee, chicken sandwich, and canned peaches. He was totally loopy from what I thought was the medicine, but I should have known it was something bigger when he threw his chicken on the ground! The man who ate the leftovers off of my plate for my whole life threw food on the ground!!! Mom came back later that night and I left. Pap passed away at 4 a.m., that dinner I fed him was his last meal. This post has gotten TOTALLY sad and I apologize! My point is this: I was happy to be there with him to give him his favorite thing, food, for the very last time. So, fast forward to this week: what would have been Pap's 88th birthday. Drinking in his honor is dumb, the man drank 1 beer a year. So I honored him with a good, Italian meal: Italian turkey sausage with onions and polenta - and my favorite dessert ever - cannoli. Happy Birthday, Pap!